The Cook Skokie I and Skokie II research vehicles were used by the U.S. Air Force to test high-speed parachute recovery systems during the mid-1950s. The unpowered Skokie I was released at about 10 km (6 miles) altitude from a B-29 carrier aircraft. After release, the test parachute was deployed from the tail, and during the following five-second drop, the Skokie's instruments recorded data to determine the rate of descent and the parachute's drag force. The parachute was also monitored by a high-speed camera. After the test parachute was released, the vehicle fell free until it was recovered by its two-stage main parachute system. It landed nose down on a spike to prevent major damage to the vehicle. The Skokie I could test parachute systems at speeds in the high-subsonic region. 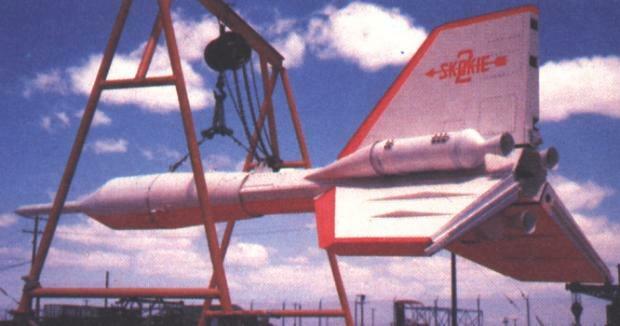 The Skokie II, which was of completely different external configuration, followed a similar procedure, but was powered by three solid-propellant rocket motors for speeds of almost Mach 2. Diameter 51 cm (20 in) ?